Fruitful discussions were held towards Fijian participation in the Asian Infrastructure Investment Bank (AIIB) at the bank’s first annual meeting in June in Beijing. The delegation, led by the Permanent Secretary for Finance, Makereta Konrote, met with Sir Danny Alexander and Henry Bell, the Vice President and Corporate Secretary, respectively, of the AIIB. The discussion was on the requirements for Fiji to become a full member of the bank. This is a significant step for our infrastructure development given Government’s focus in this area. Government has significantly increased investment in infrastructure from around 15 percent in 2006 to 40 percent of total expenditure in the 2016-2017 Budget. It will continue to invest in infrastructure over the medium term to support growth. With the need to adapt or build climate-resilient infrastructure, the Fijian Government will require innovative financing options, and the AIIB provides an additional competitive source of financing. The delegation also met with the Co-chair of Green Climate Fund (GCF) Board and Deputy Secretary of the Australian Department of Foreign Affairs and Trade, Ewen McDonald. The meeting was to discuss Fiji’s Green Climate Fund readiness programmes and support for the Fiji Development Bank to become a local accredited entity. Accreditation will allow Green Climate Fund to channel funds through the Fiji Development Bank for local private sector projects. The local Green Climate Fund workshop will provide a forum for the regional island countries to discuss ways to gain access to funds and develop regional projects. The high-level meeting was attended by the 57 founding member countries of the bank and 38 potential members and multilateral development banks (MDBs). The AIIB, a new multilateral development bank similar to the Asian Development Bank (ADB) and World Bank, was established in 2014 to address the infrastructure-financing gap in the Asia region. 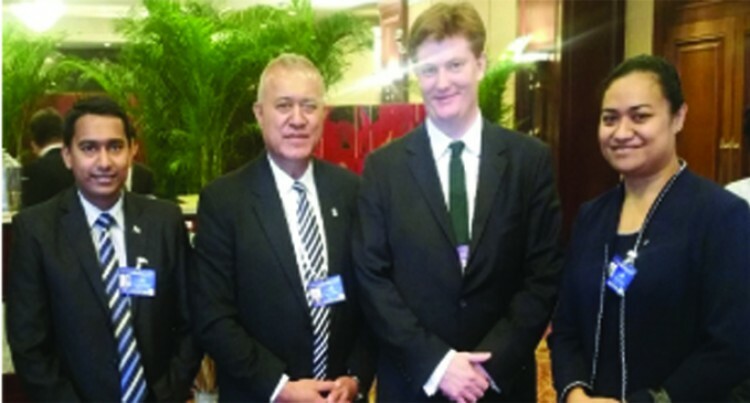 Fiji is one of two countries in the Pacific invited to attend the meeting as potential members. As with other MDBs, Fiji will be required to complete a formal legal process for accession to the bank, and approval of membership will be decided by the bank’s Board of Governors. Formal applications for membership will close in September 2016, and some 24 new countries are expected to join the AIIB by the next annual meeting, which will be held in Jeju, South Korea, in June 2017.